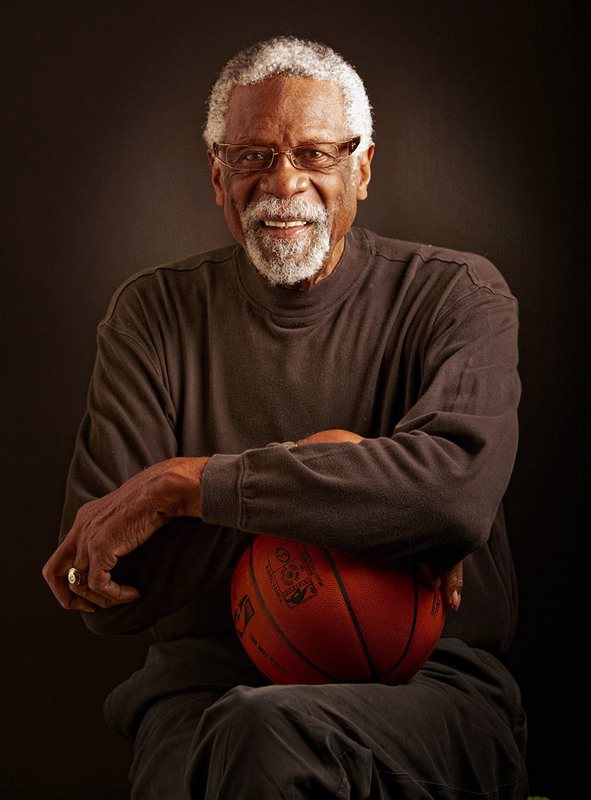 Five-time MVP, 12-time All-Star and winner of 11 NBA Championships, Hall of Famer Bill Russell turned 82 years old on Feb. 12, 2016. Here are some rare photos of the perennial winner on and off the court. 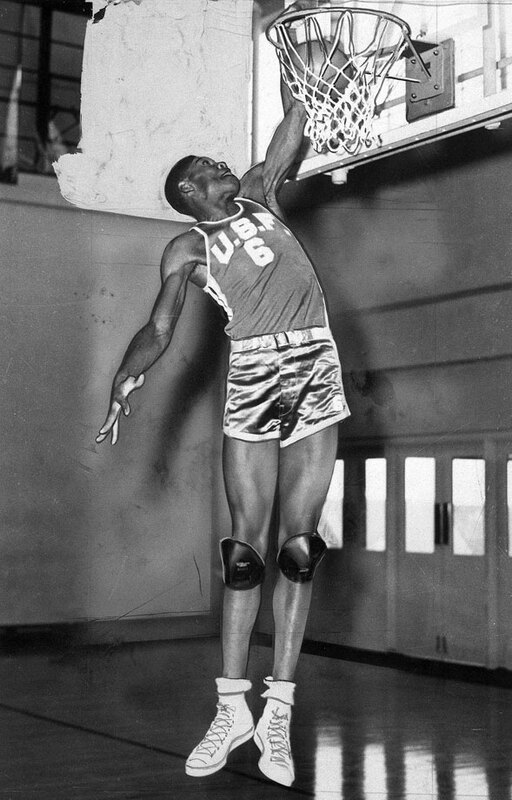 The 6-foot-9 center dunks the ball with ease, showing the athleticism that enabled him to dominate the game. Bill Russell was extremely raw when he arrived at San Francisco, and while he worked on developing his offensive fundamentals, he relied on his dunking and defense to get by. 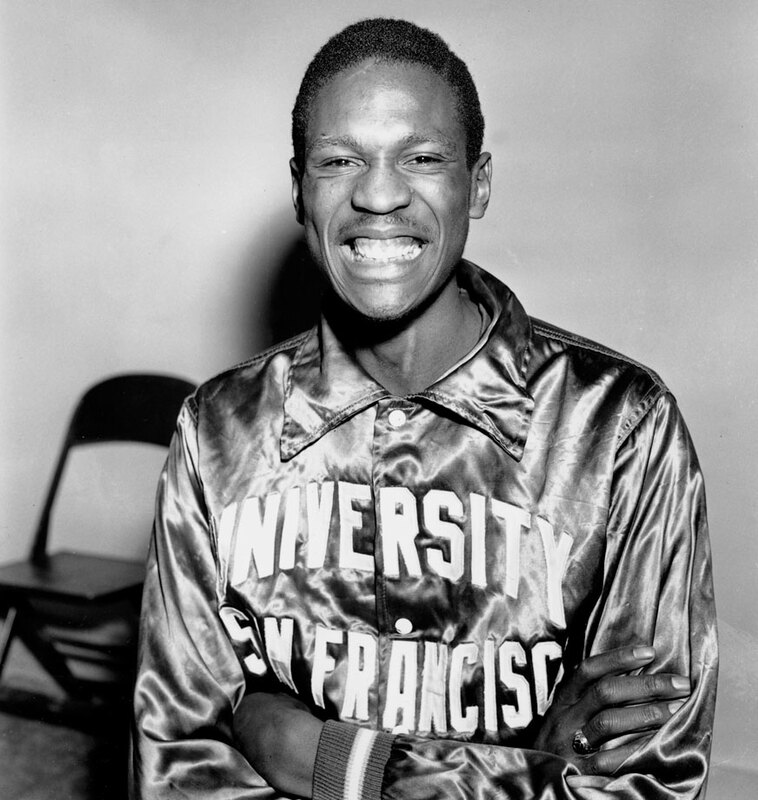 Bill Russell poses for a photo a month before he would lead the University of San Francisco to the first of back-to-back championships. San Francisco teammate K.C. Jones wishes Bill Russell good luck before the NCAA tournament semifinal game against Southern Methodist. Jones was one of the stars of the 1955 championship team, but he was ineligible in 1956. It didn't matter. Russell led the squad to a repeat championship as it went 29-0. 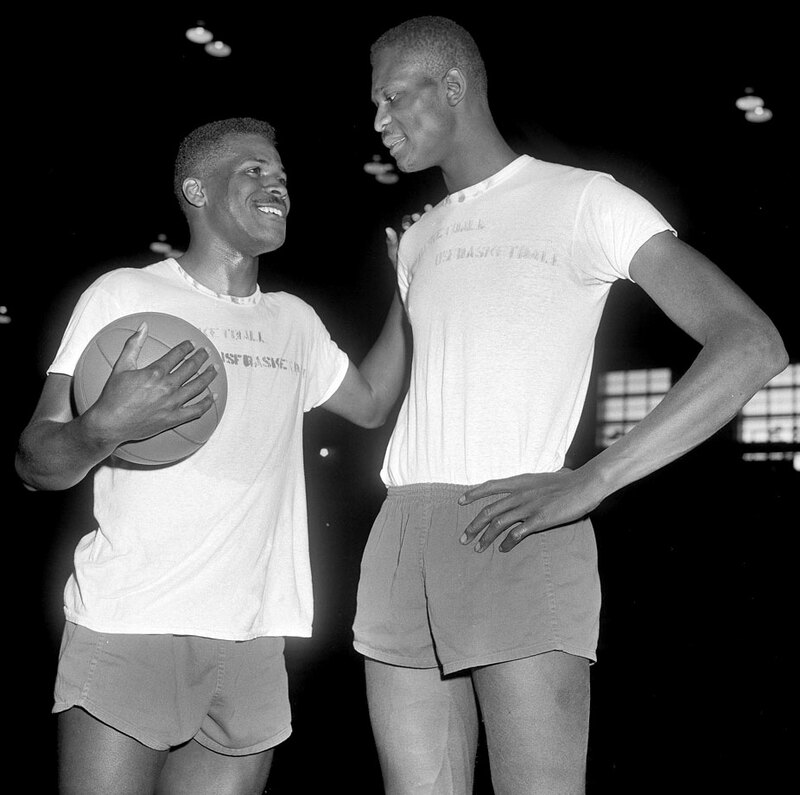 While at the University of San Francisco, Bill Russell also competed in track and field. Shown here in the high jump, and missing one shoe, Russell was attempting to clear 6-9 1/4. 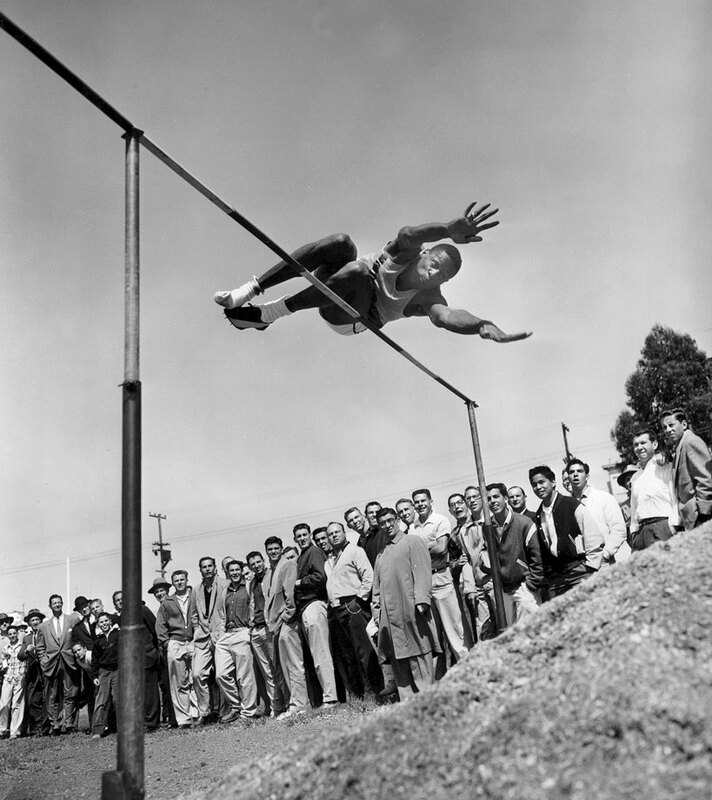 He tied for third at this meet in Los Angeles by clearing 6-6 1/4. 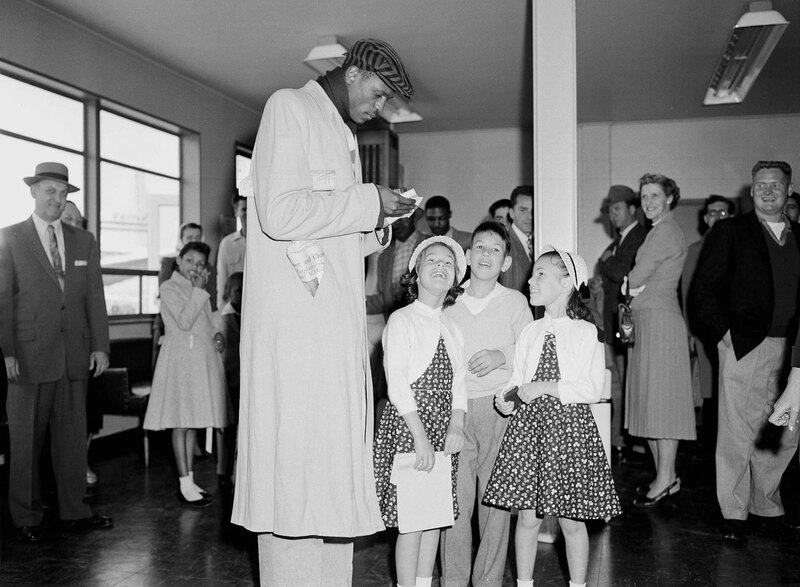 Bill Russell gives his autograph to some young fans at San Francisco International Airport upon returning from the Dons Far West Regional playoff victory against Utah. Bill Russell takes a snooze before the NCAA regional basketball playoffs in Corvallis, Ore. His 6-10 frame leaves little to spare on the 7-foot bed. The University of San Francisco basketball player poses for a photo. 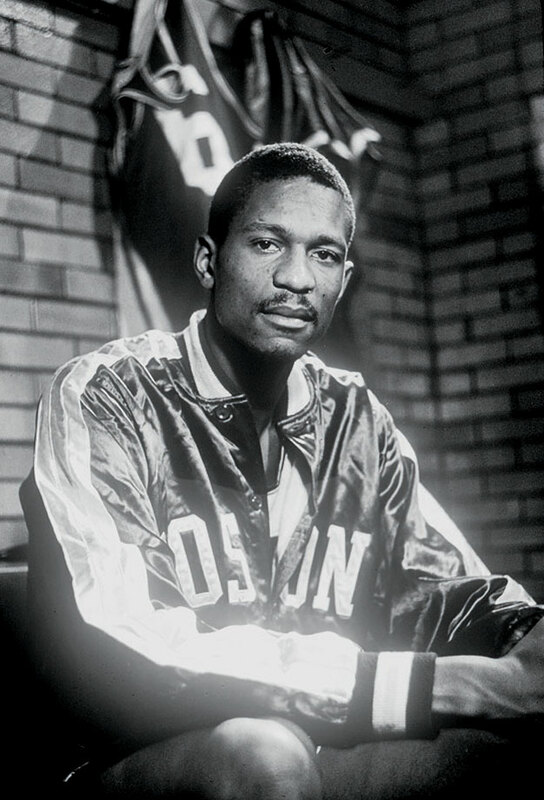 Bill Russell poses for a portrait in the Boston Celtics locker room. 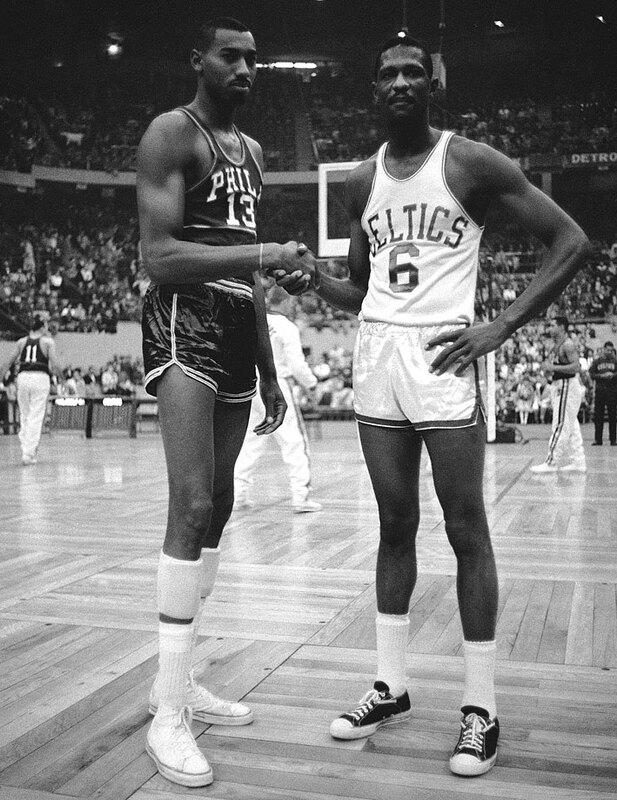 Wilt Chamberlain shakes hands with Bill Russell before a game. The rivals battled repeatedly in the postseason, with Russell's team usually coming out on top. 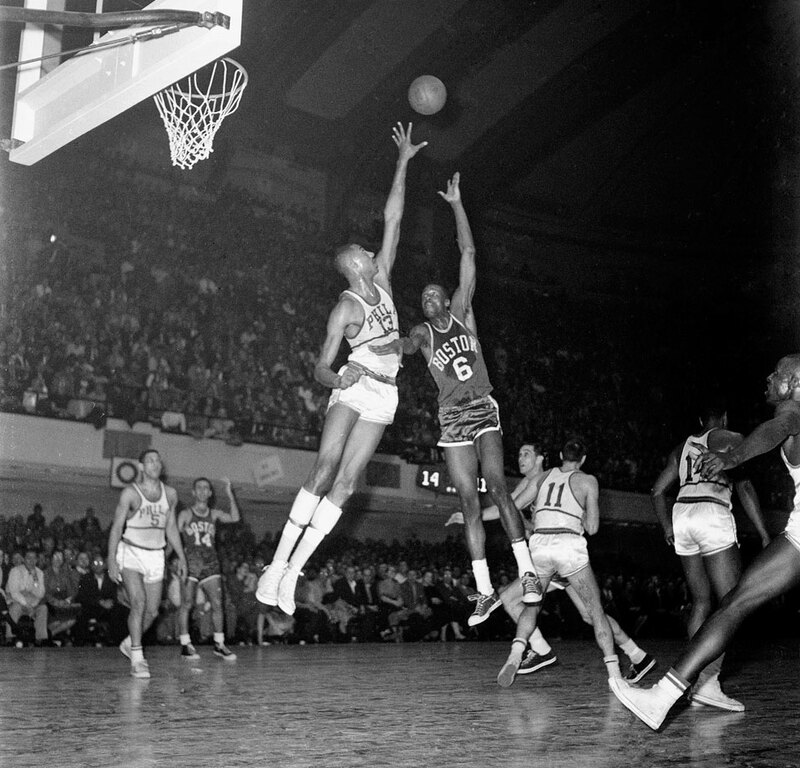 Bill Russell shoots over the reach of Philadelphia Warriors center Wilt Chamberlain during a game at Convention Hall in Philadelphia. 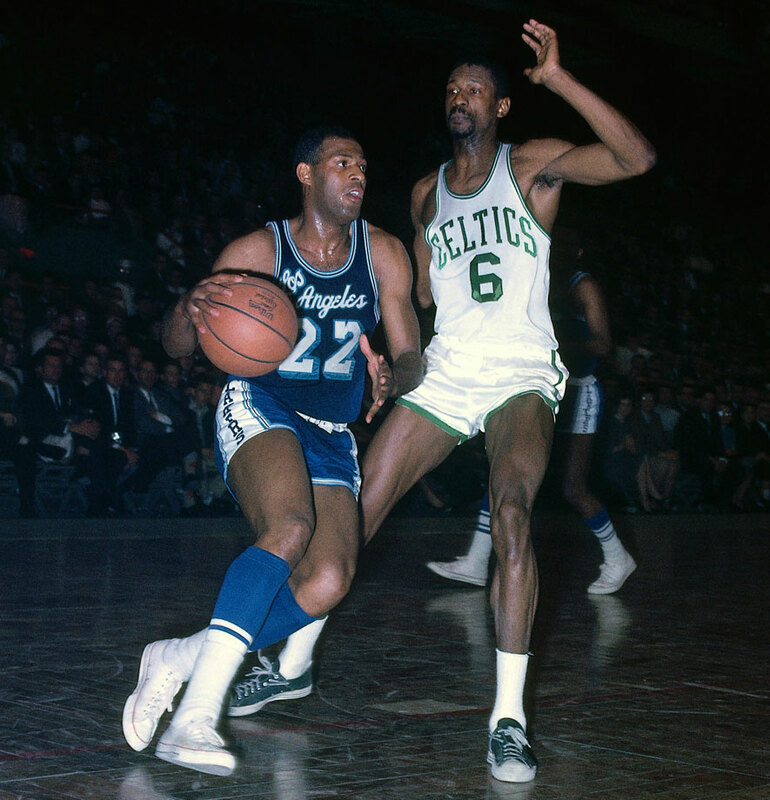 Hall of Famer Elgin Baylor dribbles up court against Russell. 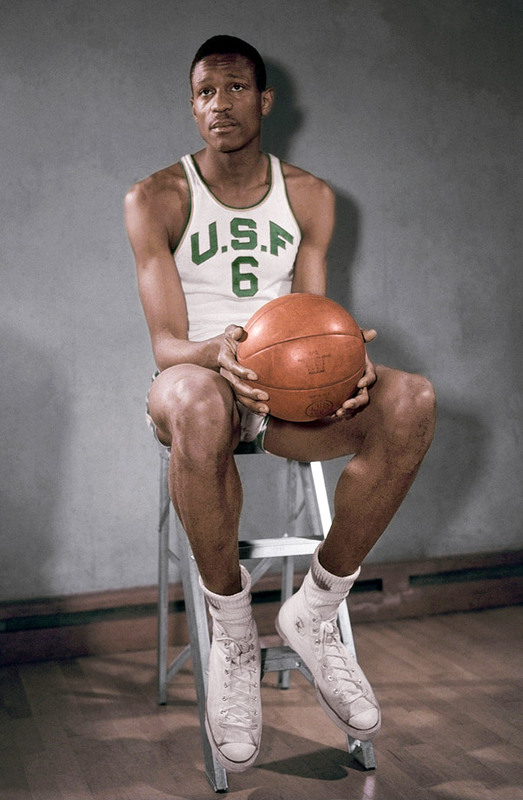 Russell defeated Baylor's Lakers for seven of his 11 NBA championships. 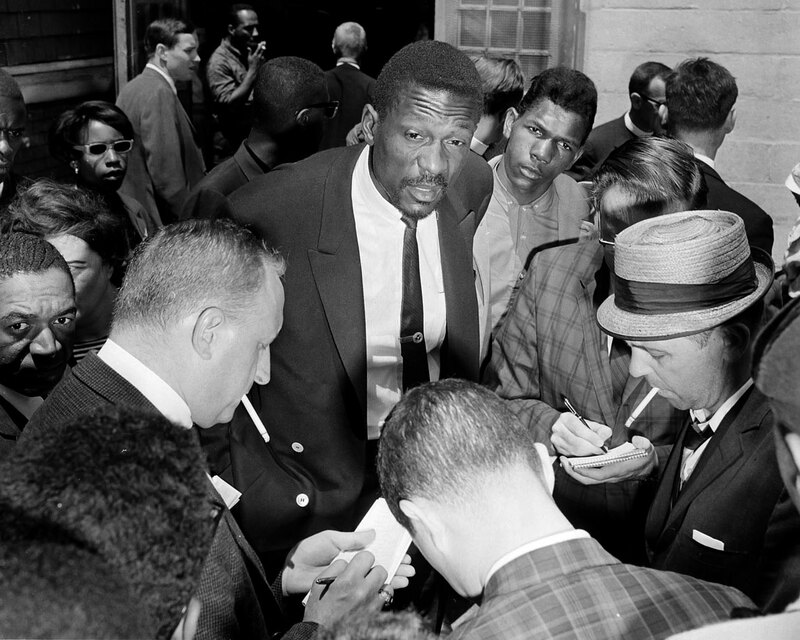 Bill Russell talks with the media after speaking with an estimated 3,000 children who had boycotted Boston Public Schools that day to protest what parents said was actual -- if not legal -- segregation. Russell has worked toward racial equality during his life. Bill Russell takes a break on the bench during the NBA All-Star Game at Kiel Auditorium in St. Louis. 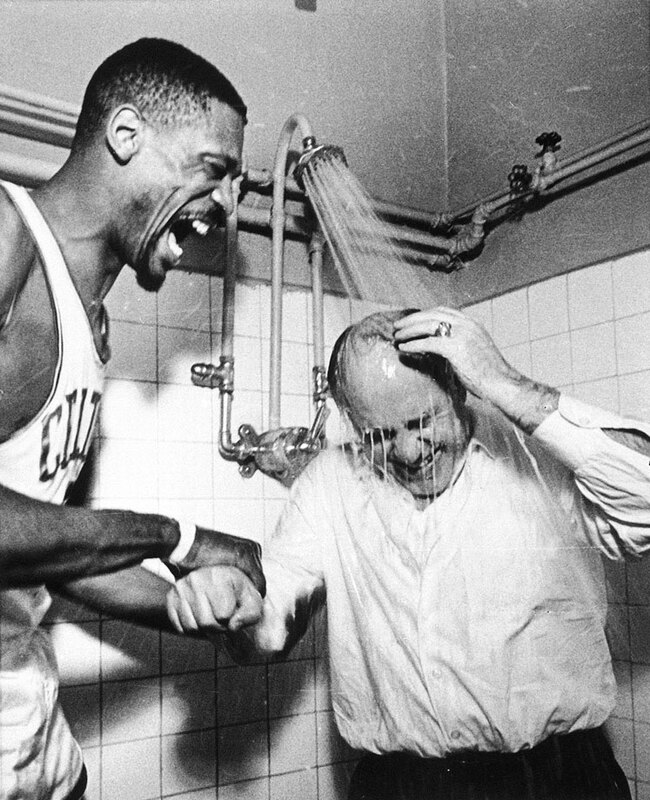 Bill Russell "persuades" Celtics coach Red Auerbach to take a shower with his clothes on Boston won their seventh consecutive NBA championship. 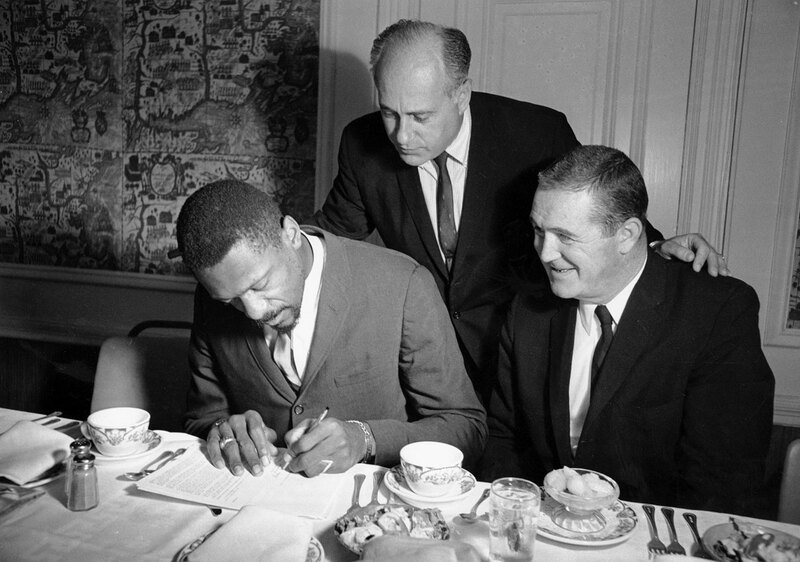 As team president Jack Waldron and coach/general manager Red Auerbach look on, Bill Russell signs a three-year contract with the Celtics. He was coming off a season in which he had won his fifth MVP award and led the Celtics to their seventh straight championship. 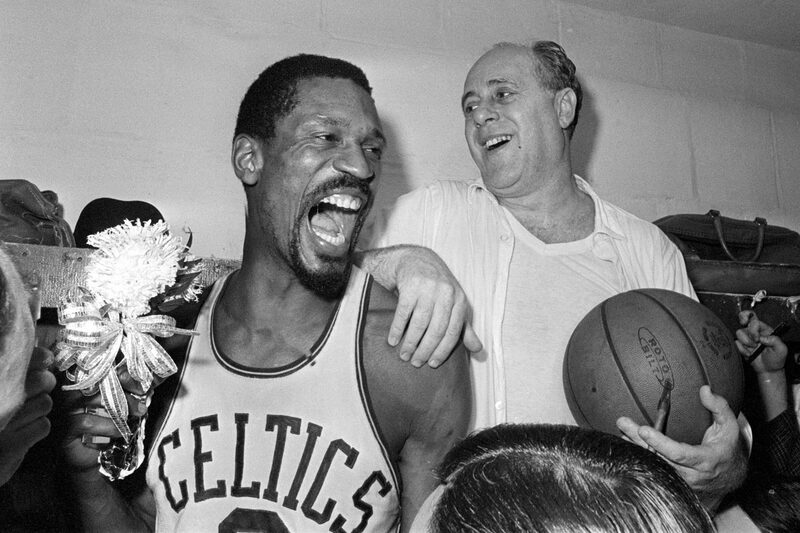 Bill Russell holds a corsage as he and coach Red Auerbach celebrate the Celtics eighth straight title. The team defeated the Lakers 95-93 to win the crown. A trainer checks on the injured center during a game. 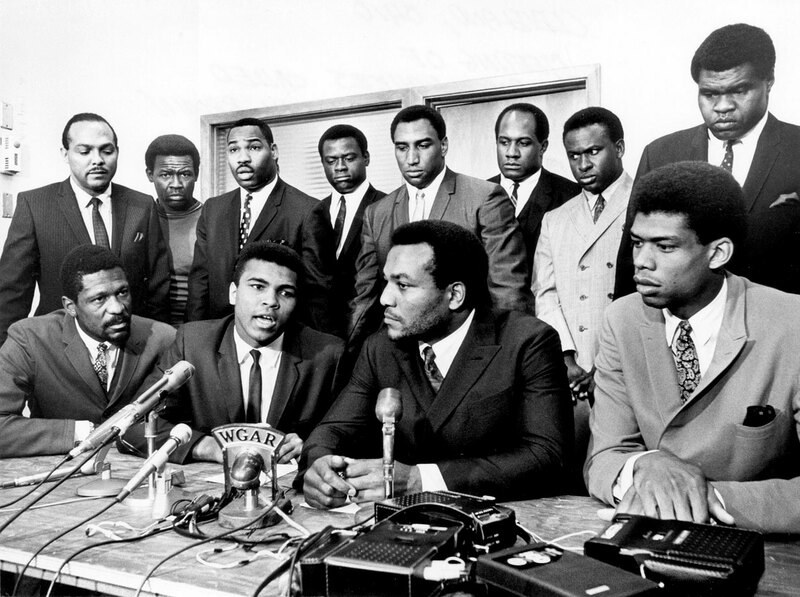 Bill Russell joined Muhammad Ali, Jim Brown and Lew Alcindor (among others) at a meeting of top African-American athletes to show support for Ali's refusal to fight in Vietnam. 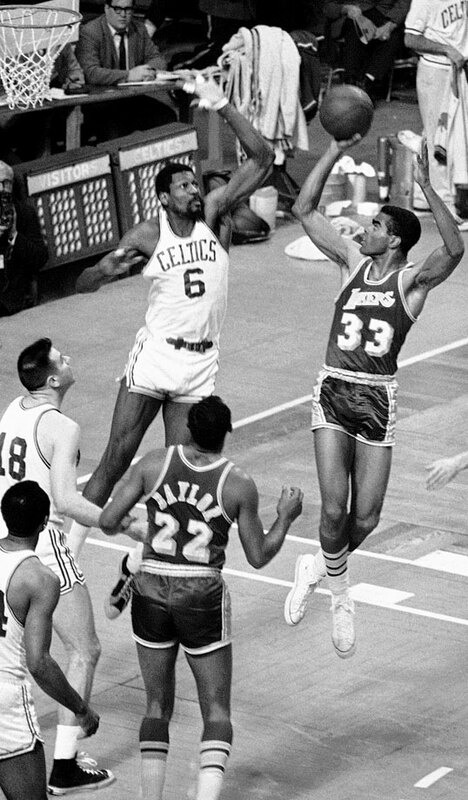 Bill Russell leaps to block a shot from Glen Hawkins in the second game of the 1968 Finals. After recovering from a three-games-to-one deficit against the 76ers in the Eastern Conference finals, the Celtics beat the Lakers in six games for Russell's 10th title in 12 seasons. 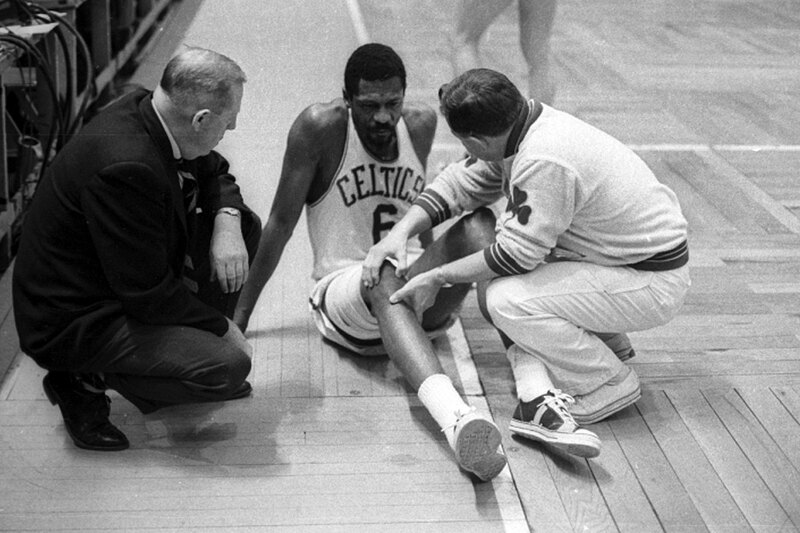 The stress of the 1967-68 season wore on Bill Russell, then serving as player-coach. The assassination of Martin Luther King, Jr. on April 4, a month before this photo was taken, is said to have weighed on Russell, too. 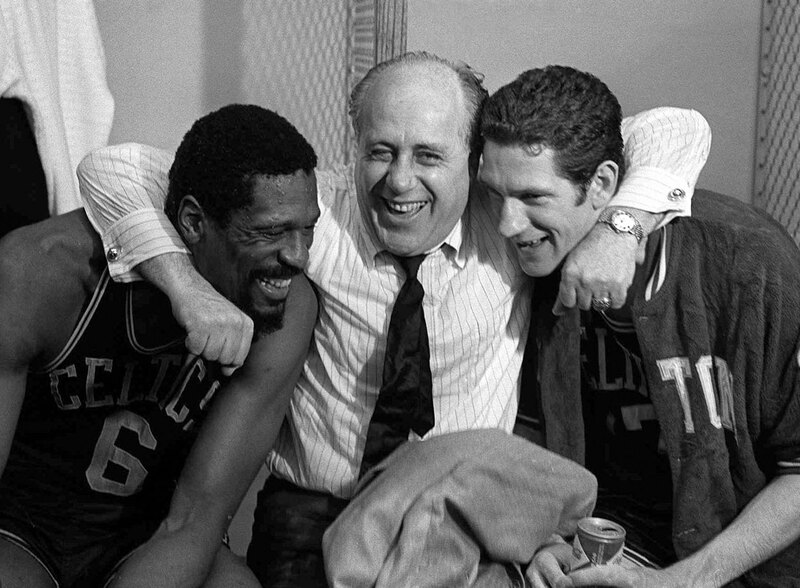 But the Hall of Famer flashed a smile alongside longtime coach Red Auerbach and teammate John Havlicek after the Celtics beat the Lakers for the NBA title, ending a tumultuous year. 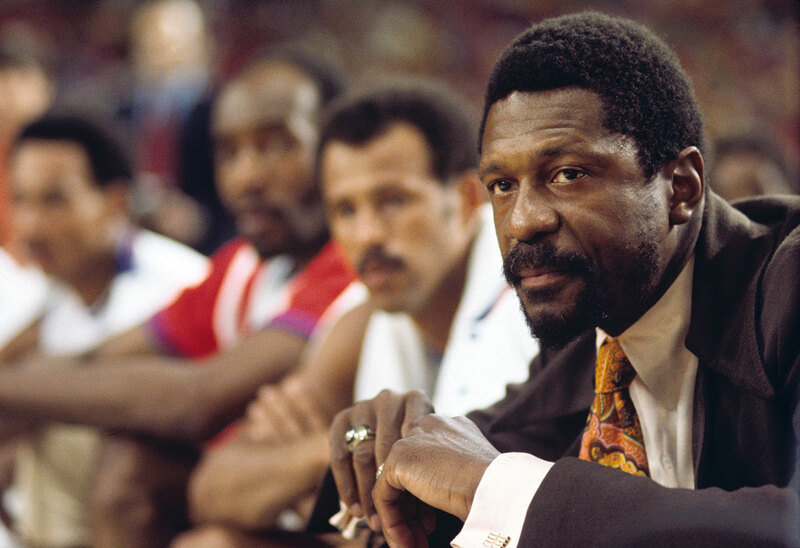 Celtics head coach Bill Russell looks on from the bench during a game against the ABA All-Stars at the Astrodome in Houston. 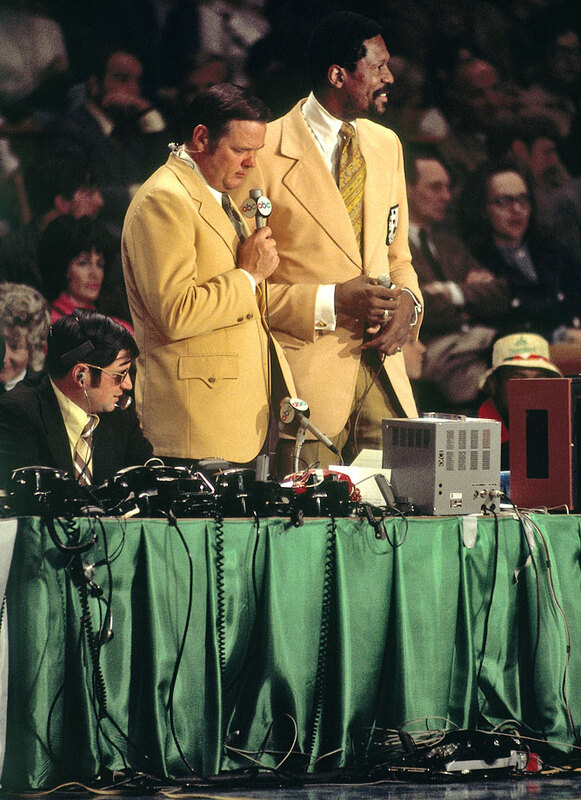 Bill Russell teams with Keith Jackson to broadcast a Celtics game. 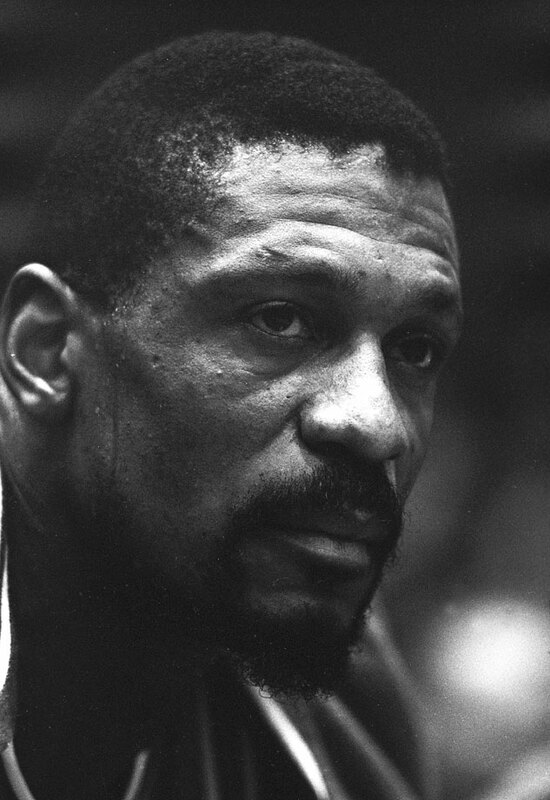 The former center retired in 1969, after 13 seasons. 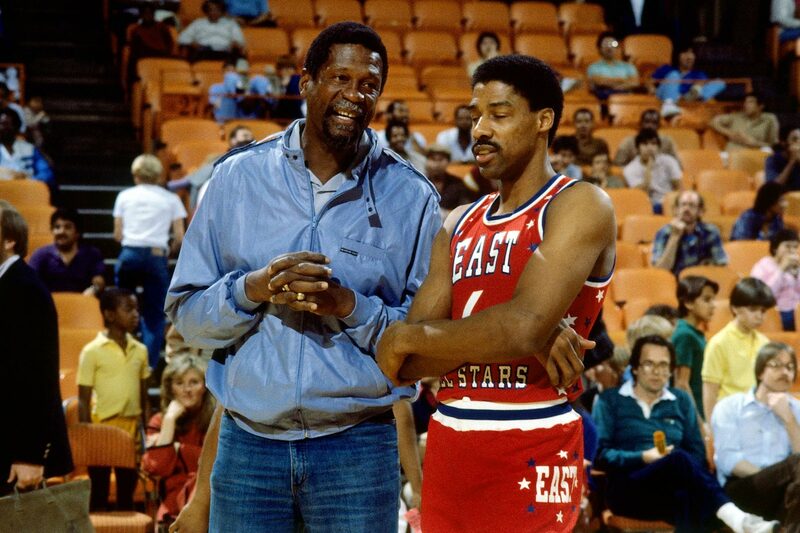 Bill Russell chats with Julius Erving before the All-Star game at the Forum in Inglewood, Calif. Dr. J won the game's MVP award after leading the East to a 132-123 win. 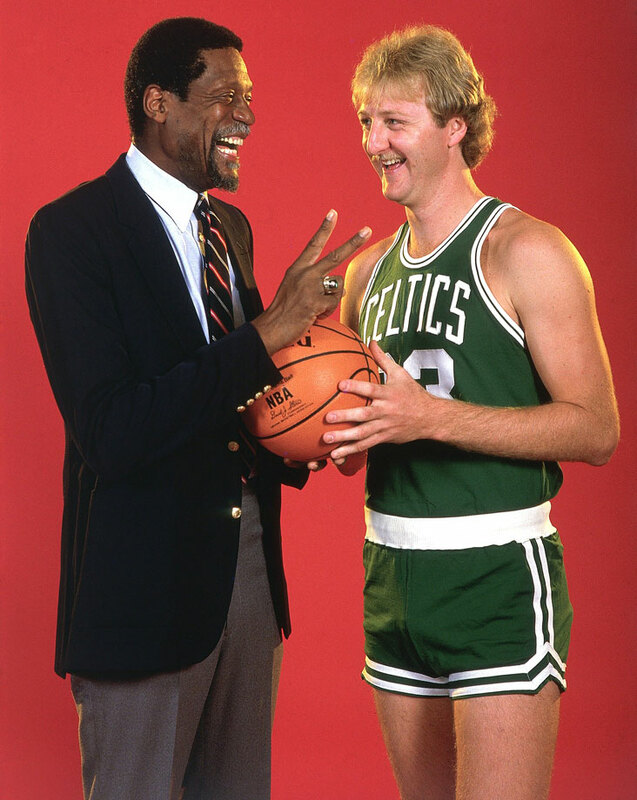 Bill Russell and Larry Bird, two of the all-time best NBA players, talk with each other. The pair is a big reason Boston has more NBA championships than any other franchise. 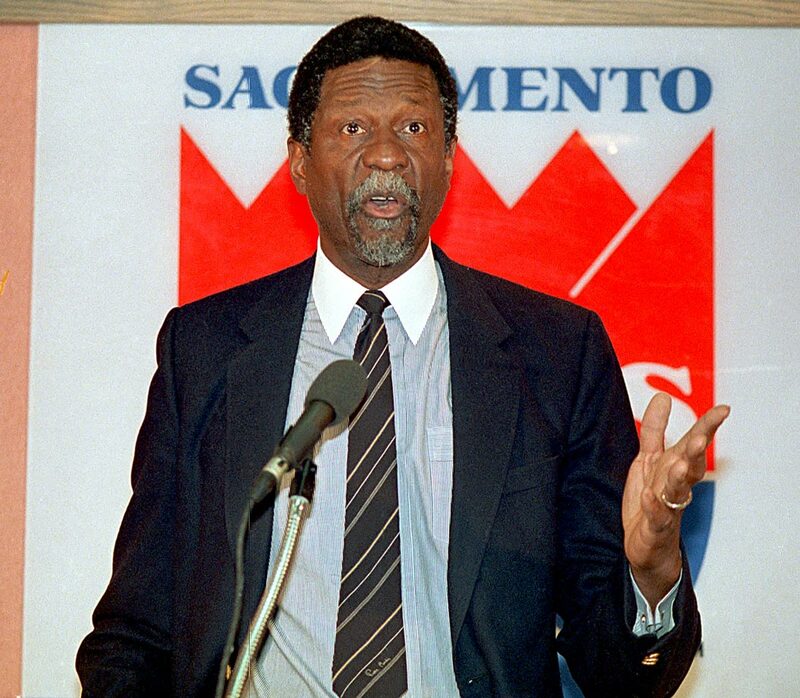 Bill Russell speaks with reporters after being named head coach of the Sacramento Kings. He struggled in his third stint as coach -- after three successful seasons as Boston's player-coach and four mediocre years with Seattle. Russell lasted less than a season, compiling a 17-41 record. 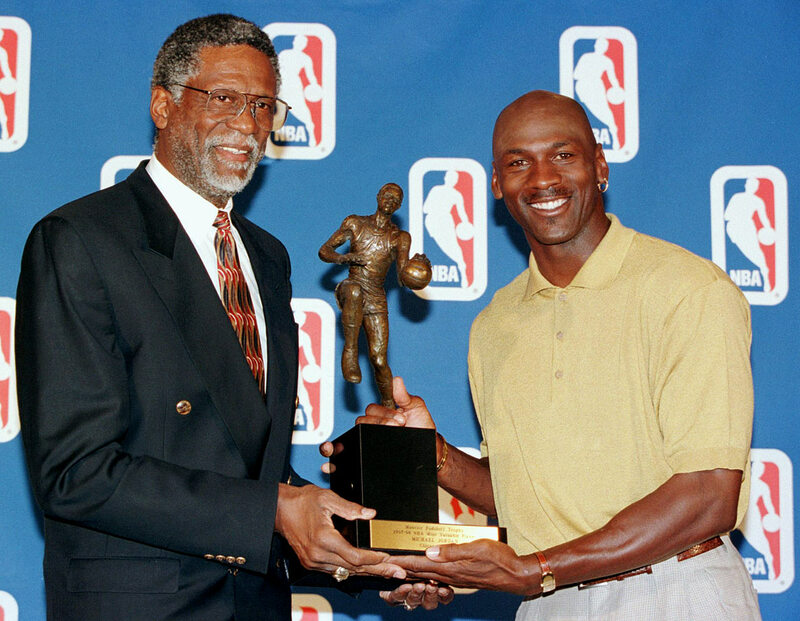 The Celtics great poses with Michael Jordan as the Bulls star receives his fifth MVP award. Russell also won the award five times, including three straight, beginning in 1960-61. 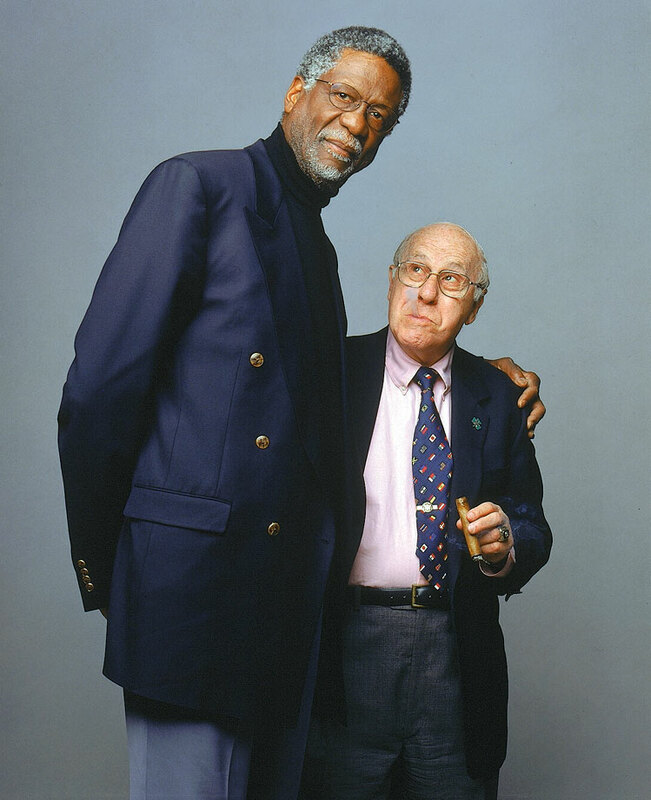 Celtics legends Bill Russell and Red Auerbach pose together for a portrait. 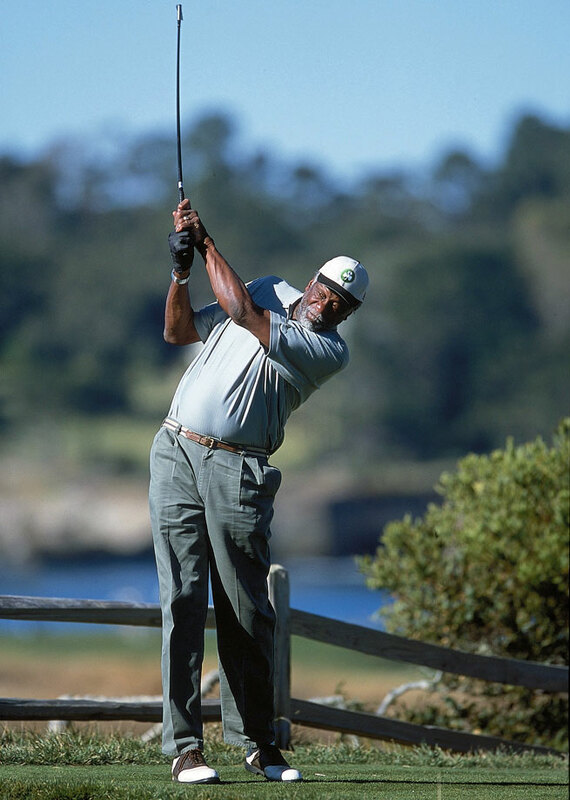 Bill Russell shows off his golf stroke at the Pebble Beach Pro-Am. 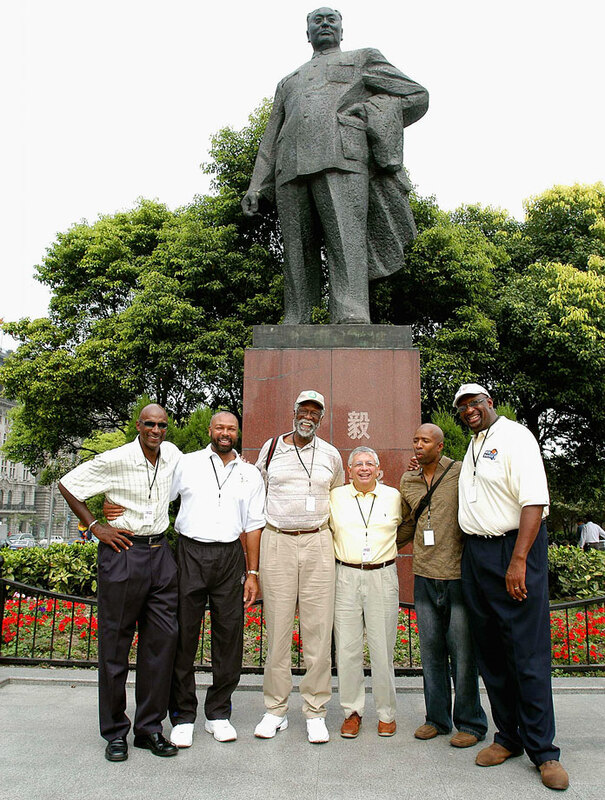 Commissioner David Stern and former players Clyde Drexler, Mel Davis, Bill Russell, Kenny Smith and Bob Lanier pose in front of a statue of Chairman Mao in Shanghai. 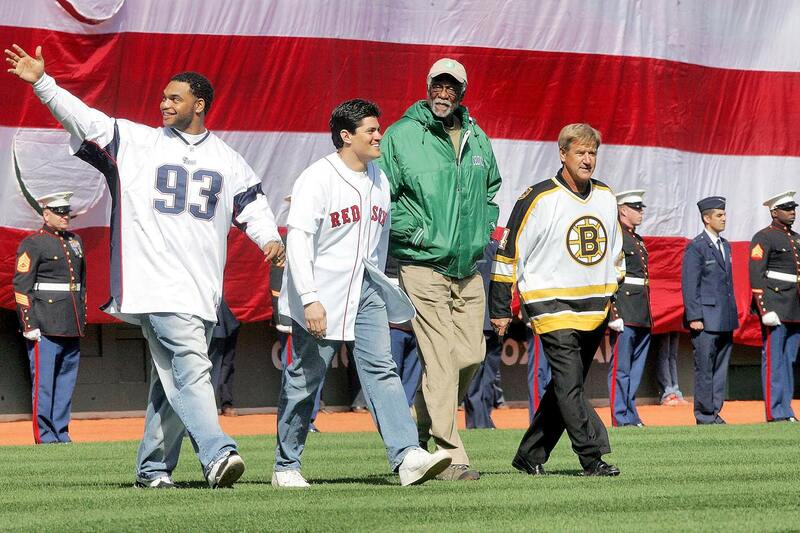 New England Patriots stars Richard Seymour and Tedy Bruschi walk to the mound alongside Bill Russell and Bobby Orr to toss the first pitch before the Red Sox home opener against the Yankees. After the Red Sox banished the Curse of the Bambino the previous fall, the team brought in some of Boston's biggest champions for the ceremony. 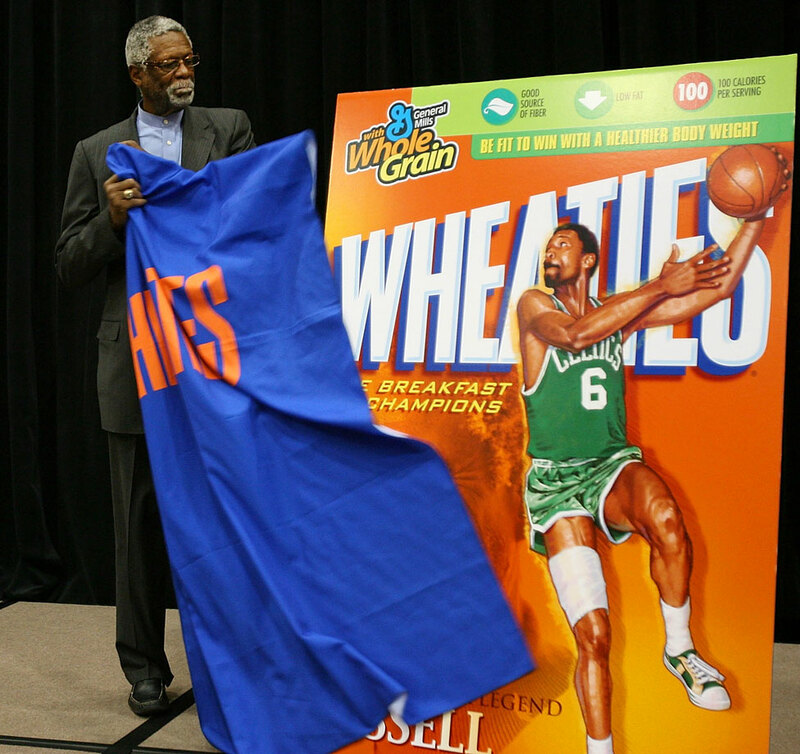 Russell unveils a new Wheaties box featuring his picture during a ceremony. 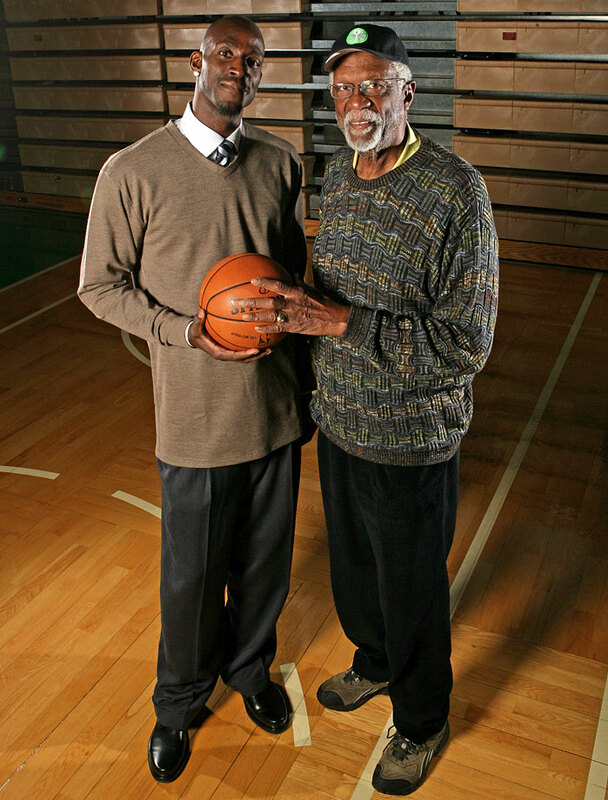 Kevin Garnett poses with Celtics legend Bill Russell. 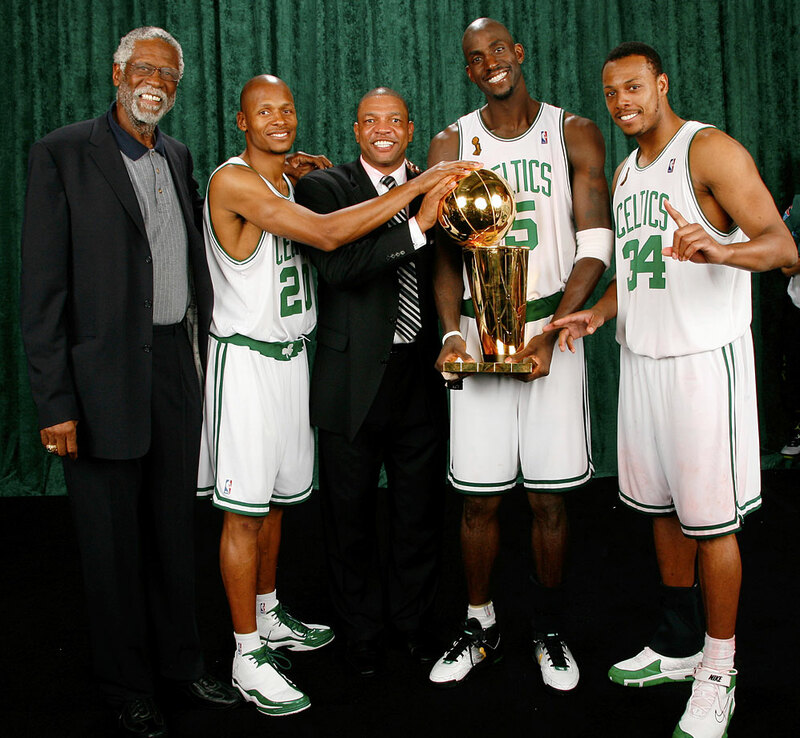 Bill Russell poses with Celtics Ray Allen, coach Doc Rivers, Kevin Garnett and Paul Pierce after they led Boston to a championship-clinching victory over the Lakers in the 2008 NBA finals. It was the 17th title in organization history. The Hall of Famer poses during an SI photo shoot. 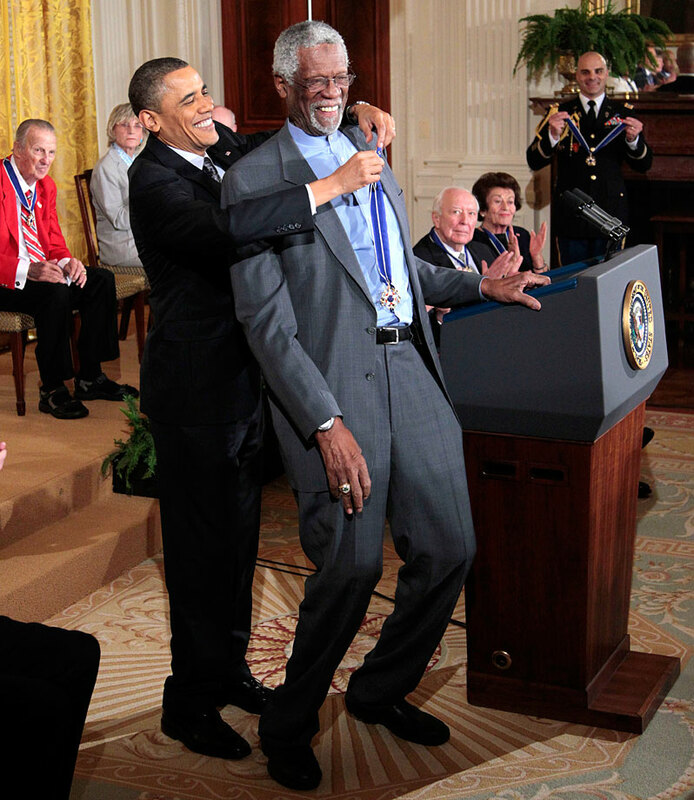 President Barack Obama presents the Presidential Medal of Freedom to Bill Russell. Obama said the 15 recipients of the award "reveal the best of who we are and who we aspire to be." 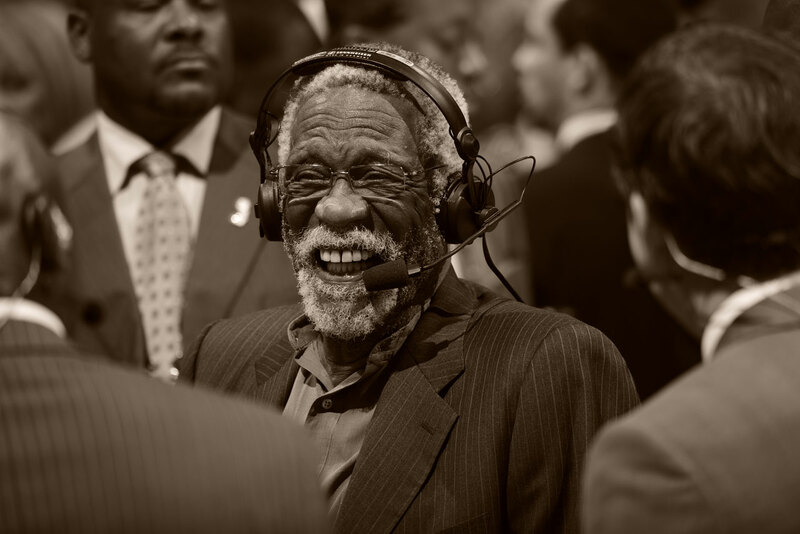 Bill Russell has a good laugh during Game 6 of the NBA Finals between the Miami Heat and San Antonio Spurs in Miami. 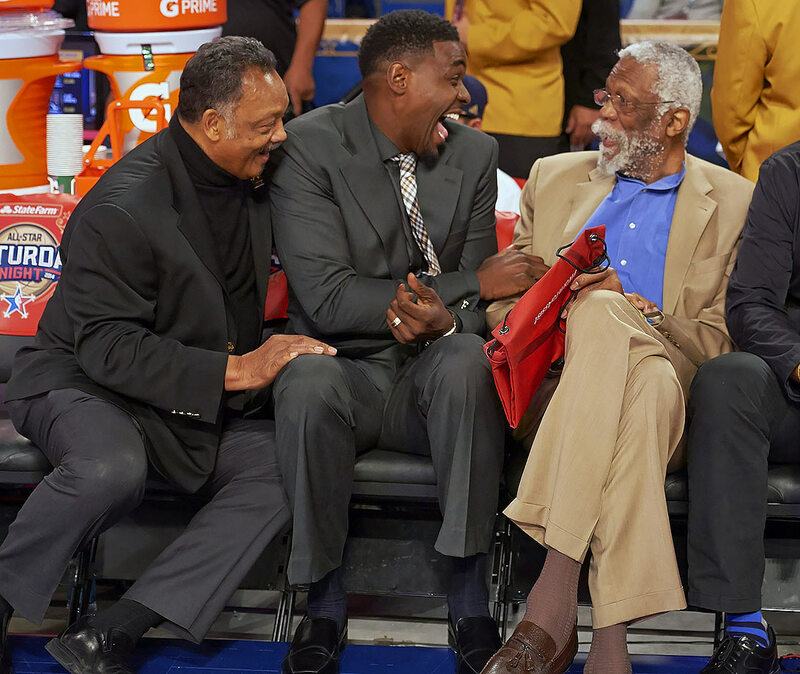 Reverend Jesse Jackson, NBA TV analyst Chris Webber and Bill Russell share a laugh during NBA All-Star Weekend in New Orleans. 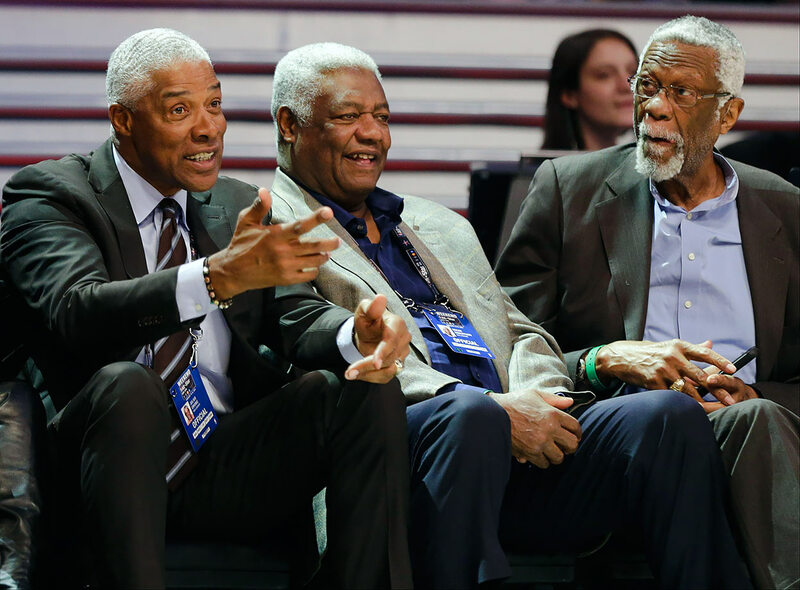 Julius Erving, Oscar Robinson and Bill Russell talk during the NBA All-Star Saturday Slam Dunk contest in New York City. 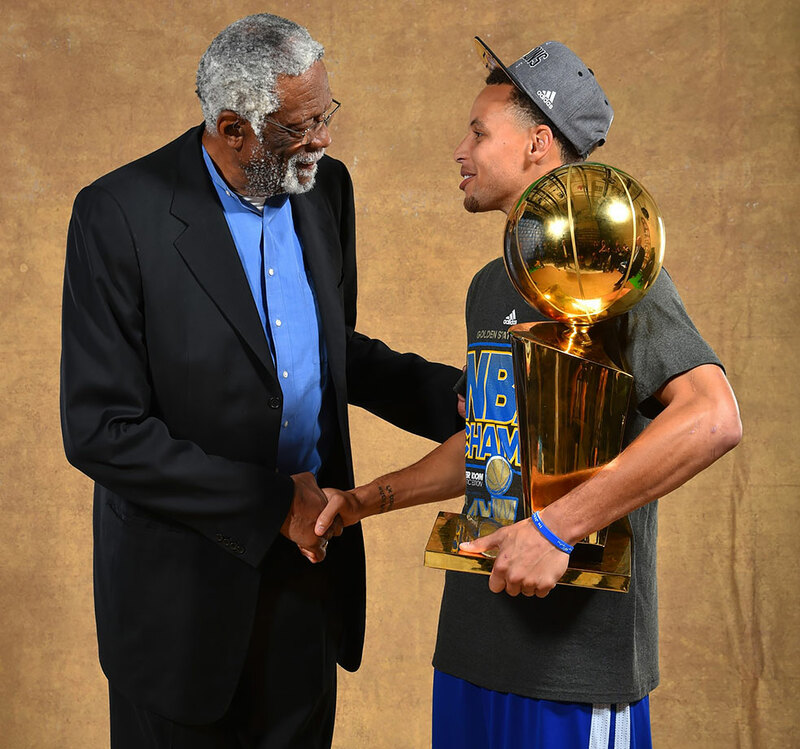 Bill Russell congratulates Golden State Warriors point guard Stephen Curry, holding the Larry O'Brien NBA Championship Trophy, after defeating the Cleveland Cavaliers in Game Six of the NBA Finals in Cleveland.